I did Bike New York's Five Boro Bike Tour yesterday; my ninth in a row with my heavily modified 1981 Turner recumbent. Say it with me with Ed Rooney (the dean of students from Ferris Bueller's Day Off) intonation: nine times. The hours I spent tuning and adjusting the bike paid off: the brakes were more responsive and more comfortable to use, and the rear wheel that I had cannibalized from a junked Fuji Espree more than two years ago lived long enough (and was true enough) to power me through a third tour. Now I got my cookie from Zaro's (but nearly had a Rain Man-unable-to-watch-The-People's-Court moment when the first one didn't have the cookies; but luckily the second GCT location did, and it fit easily into my new, slimmed-down bike box). I pedaled down to the start around 6:30 in the morning, and I have to say that even though it was very cold at the start line (I am not the only one who packed light due to the new security restrictions) there is nothing like the City That Never Sleeps when only the cyclists are awake. It was also exciting to see the construction progress on the Freedom Tower, as well as new, empty bike stations for CitiBikes, the bike share program launching in NYC this summer. I also enjoyed seeing bikes that I don't normally get to otherwise, including the fascinating tandem known to allow both riders to have a clear view of the road ahead from Hase. 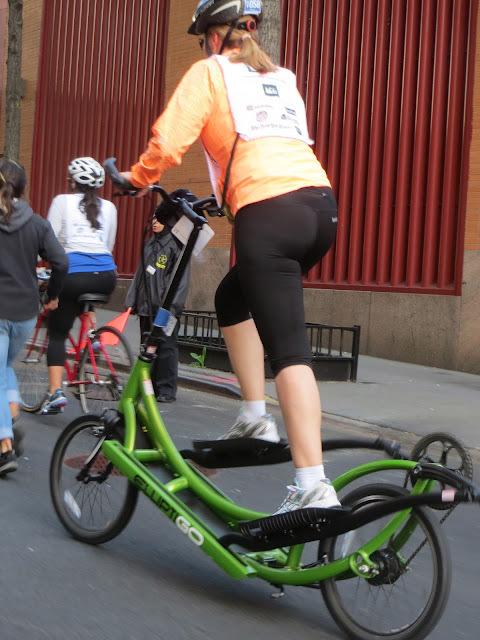 I also saw a couple of people on an Elliptigo, which combine the thrill of the gym with the sensation of actually going somewhere while you exercise (when you stop using it make sure you towel it off per gym policy). I also saw the guy from High Roller that I met at Bike Expo New York riding on his creation - and taking some action shots. He was impossible not to notice as the rumbling sound from the plastic rear wheels did make a distinctive sound, much like the boulder did when Indiana Jones was trying to escape with the golden idol. Some roads had been repaved and were in better shape than in previous tours I've done (with a short wheelbase recumbent, I notice these things). The festival was also noticeably better this year than in the past. 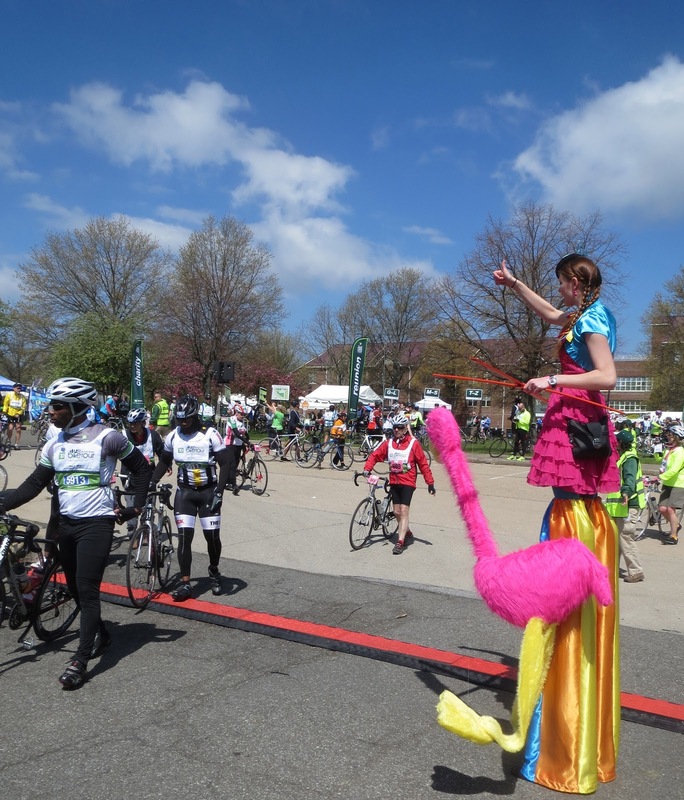 Because of the scattered start times, it wasn't packed too much with cyclists by the time I got there, and, even better, featured food trucks and other local places where one could eat. The Bubbas' Barbikyu had a tent with sticks of their outstanding grilled pork and chicken. And service with a smile. I ate lunch around quarter to eleven in the morning yesterday, and I ate fast, but not before two people - one of them a young and sweaty woman who was looking at me as though she had spotted a cast member of Downton Abbey - asked me where I had gotten what I was eating. My mouth full both times, I could only manage to point vaguely at The Bubbas' tent. The festival felt more like a festival atmosphere, and I stayed a lot longer than I normally do. On the two-plus mile ride to the ferry dock, I noticed, to my dismay, a lot of areas on Staten Island still had significant Hurricane Sandy damage. I could only hope that, just like the Freedom Tower, everything was a work in progress. 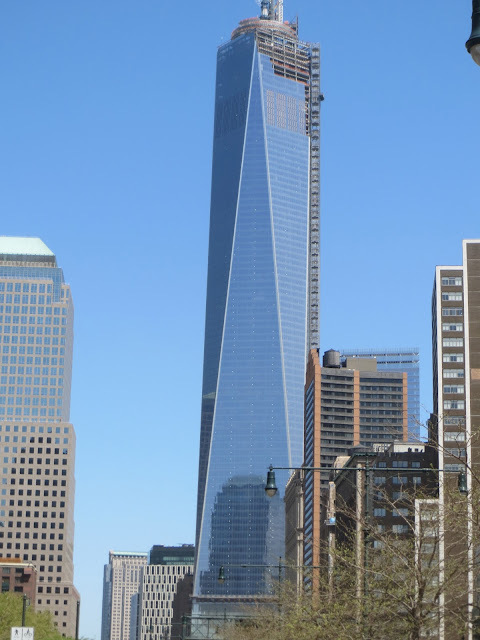 The picture above is what the Freedom Tower looked like yesterday. In case you are wondering, the picture below is what the Freedom Tower looked like an hour or so after Five Boro Bike Tour 2012 ended. There was something else that I noticed differently from the previous times I've ridden the FBBT. Maybe you saw it too: recycled, water-filled 16 ounce Diet Coke bottles jammed in frame cages and similar arrangements. A Poland Spring water bottle dropping loose and skittering across the pavement, with the former owner not noticing or not caring that it had gone. I also noticed not one, but two frame pumps abandoned in the road at two separate locations. A fallen hat on Staten Island. A small box containing a 700c tube sitting in the middle of a curve in Brooklyn. And I was in the Blue Group that started at 7:45, so who knows what hit the ground after the other twenty-thousand or so riders started off. I think there was just more fallen personal items this year, and the reason may have to do with the new security restrictions: Unable to use panniers or large-capacity trunk boxes, riders traveled light and used frame pumps (that come loose all the time) and weedy bungee cords to hold their personal stuff. I don't know anything about what caused the two accidents I saw on the tour (only saw the aftermath) but I am willing to call the Freakonomics people to see if they have weighed the odds of what is more likely to happen to a cyclist: to fall victim to a terrorist attack, or to fall on the Deegan because they hit a piece of debris in the road. If my law-of-unintended-consequences parable makes any sense, I hope the NYPD and Bike New York has a chance to rethink their security restrictions for 2014 - not just because I want my Even Better Bike Box, but because it may just make everyone safer in the long run (and it may also make more people willing to buy T-shirts and other things at the festival - as they'd have room to put their loot). I do thank Bike New York for putting together another winner and hope you share your appreciation with them too, and start planning for May 4, 2014. Thanks for reading and thanks for riding. Awesome post. Congrats on doing it again! This was my second but my 16-year old son's first. We had so much fun! Good stuff. Always a fun day. Thanks for sharing! Michael, this is a great post. I feel like on was on the ride with you. It was really nice to see you at the finish line. And of course, thanks so much for your review of The Bubbas. We hope they will invite us back again next year.